Year 2001, I was still in College back then. 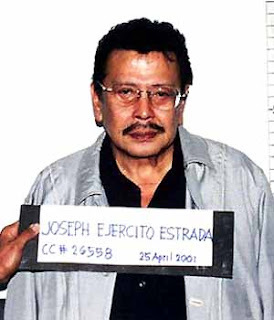 I am proud to say that I am one of the youth that went to Edsa 2 to oust president then Joseph Estrada. Now that its just hours away from the Sandiganbayan’s verdict against Estrada, I feel worried that it might be an acquittal and the essence of Edsa 2 will be wasted. Political analyst said that the verdict of Estrada would test the stability of the Arroyo’s presidency. Given that it’s an acquittal verdict, the issue of Arroyo’s presidency on 2001 would be questioned once again. And that would be chaos. I saw again former Vice-President Teofisto Guingona on TV appealing for Estrada. For God’s sake, he stole money from the people. He has unexplained wealth and mansions. I just hope it’s a guilty verdict. Politicians have to watch out now or you would be the next Erap. he's the first one to be convicted. i hope gma would be next together with her husband.